Usually it’s a good idea to get your apps from the Android Marketplace. But, sometimes you might want to download an app that isn’t on the Marketplace yet, such as SWYPE or maybe you are developing your own app and need to test it out. By default, Android doesn’t allow apps to be installed if they aren’t from the Market, and Google has openly included a groovy setting that will instantly unlock that. Let’s do it! Note: These screenshots were taken using a Samsung Galaxy Epic 4G. Actual menu locations and annotations may vary depending upon your device manufacturer but they should be similar. 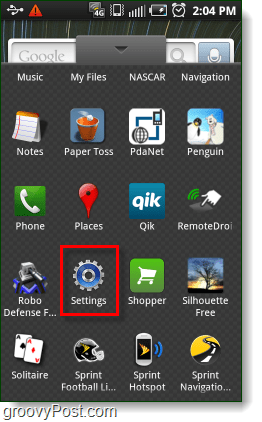 Access the settings menu on your Android phone. 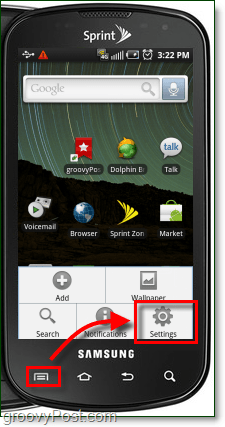 Most phones have an external menu button that when pressed allows you to Select Settings. However, you can always access settings from the app drawer. *On HTC devices applications may be known as Programs. An Attention pop-up will appear. It is just warning you that third-party apps can sometimes be unsafe or contain viruses, but as long as you only install them from trusted developers you should be fine. 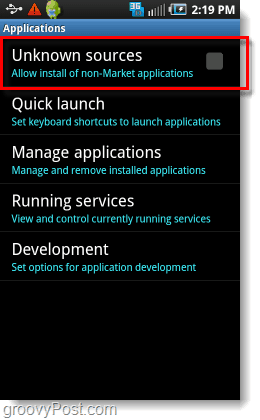 Android is now set up to allow install of non-Market applications! Now you can install any app from anywhere that you want, but do use common sense and make sure you do some background checking when downloading from an unknown source. where is the reply button for the article blog or whatever? Some stock phones DO NOT HAVE THIS OPTION. Thank you to the author for including a screen shot of each step. After spending 30 minutes fiddling with my phone trying to figure out why I couldn’t find the option to allow unknown sources (sideloading I guess), I realized that AT&T’s stock Captivate ROM does not allow sideloading, and this option is entirely missing from the applications menu. I have an unlocked Moto Z Play and Nova launcher, can’t find that option either. 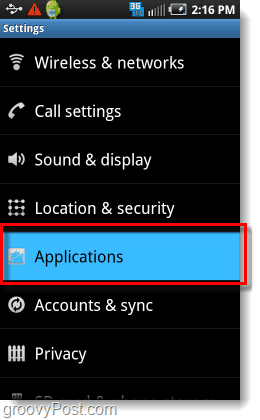 Settings, Applications gives you a list of all applications. Will these Android apps also work on my new Coby tablet pc? I also would like to know if it is possible to use these on Android Android tablet with a 2.1 . Playing games in cellphone is perfect for relaxing. Your evplanation and pictorial is good, but my Samsung Galaxy S does not have that option… what else can I do? Groovy – I assume this helped you out? Thanks for the easy step by step procedures of downloading. Yes, but what do you do if you go to your settings > applications and “unknown sources” is not even THERE. How do you get around that? I have the Samsung Captivate, a Galaxy S phone. 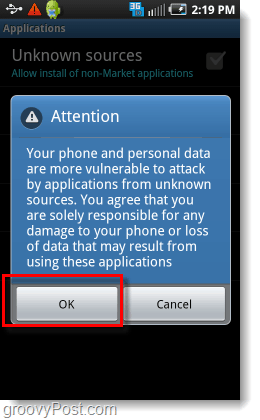 I have a samsung captivate with Android 2.1 In settings–> Apps, I do not see ‘unknown sources’. How do I get it. I download the apk file and is in Sd card already. Also I have the app installer downloaded. I too have 2.1, and this option is unavalible. Is there a way to get around it? Or possibly another way? @Disne – Are you saying you cannot get into Market? Your password is not working? @Beverly? Sorry, I don’t follow. Say that again? I have downloaded a game to my phone and can not find it.Where would it be? Hi. I have the Pandigital Ereader, whitch is an Android tablet. I have done this at least a million times, and it keeps saying that it can’t be installed on my tablet. Can I do anything so I an download them? I really need help. Thanks! I have a Samsung Captivate and under “Applications” there is no “Quick Launch” or “Unknown Sources”. Someone mentioned I may have to root my phone, is this true? Can you tell me how to get Flash player 11 on my Cruz T301. Cruz is not supported on Android Market. Thank you. Hi Ley, I don’t personally have a Cruz T301. But, please feel free to post your question in the free Answers community where I’m sure one of the community experts will see your question and help you get an answer. Your question also has a MUCH better chance of being seen by other groovyPost writers from the Answers forum as well. Just to let others know, on three Samsung Galaxy S 3 it’s a bit different – settings > Privacy and that’s were you find the option. Hi Ashley. What model phone are you using? Hello, I was wondering how the heck that could happen with iPhones. Or if it’s possible at all for iphones at all to have this option?